I very rarely go out looking for arthropods with other people, but this weekend, abikeOdyssey and I made a short little trip out to Red Bud Valley Nature Preserve this weekend and spent the better part of Saturday wandering around the area. Several of these little Holcocephala fusca robber-flies were out and about. I've photographed them before, but it has been an entire year since I've seen them around. I just can't get past how beautiful those compound eyes are - without a doubt some of the most impressive out there. 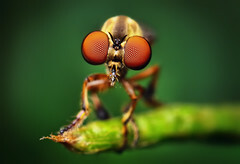 This is a crop from and image taken with the 50mm reversed on extension tubes. I don't like having to say it - but could you guys cool it with posting all those big flashing group invite pictures in the comments? It's alright if you want if you want to to invite me to a group, and I appreciate the enthusiasm, but try to understand that they are interpreted by some as a bit annoying. So in short - don't follow your group rules.